Home / Fantasy Baseball / A Gentleman’s Cup Series Champion has been Crowned! A Gentleman’s Cup Series Champion has been Crowned! Friday night was a landmark night in five men’s lives. Now as a footnote in the whole thing, Diamondhoggers won the final Gentleman’s Game of the year to avoid the basement, and finish tied for third place with our own t3bird04. But the real story, was the battle between DStars45 and Swindaman3. All year long it was like Apollo Creed vs. Rocky Balboa, these two heavyweights slugging it out one weekend at a time. Rumor has it that the two did not even speak for six weeks down the stretch while trying to decide who would come out on top of this duel. And in the end, Swindaman3 had his opportunities granted to him by his fellow gentleman. They stayed out of last place, leaving the door open for Dstars45 to find himself there; with a win, a tie-breaker match would have been forced between the two Gentleman at the top of the standings. However, Swindaman3 in his time of need reached for the likes of Ervin Santana and Torii Hunter which proved to be a fatal misstep. He did however, post an impressive 30 points from Luis Valbuena which is the kind of thing you need to do to win a Gentleman’s Game. 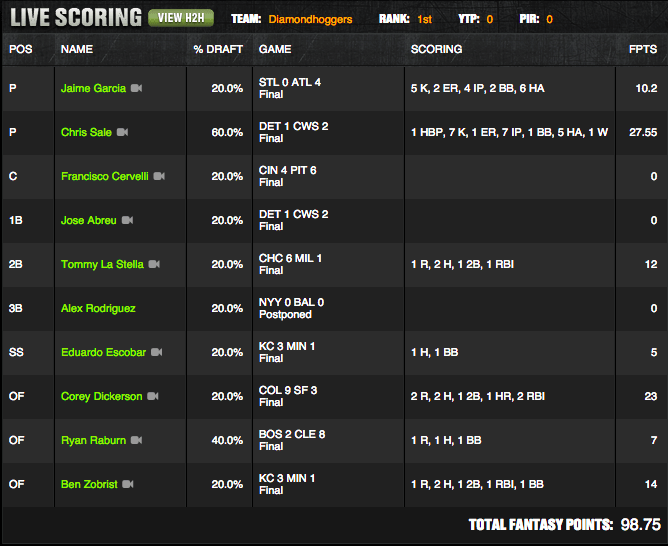 Here’s a copy of the final winning lineup from Diamondhoggers. You’ll see that no gentleman tallied 100 points, this is the kind of Gentleman’s Game muck that’s just fit to rake for Diamondhoggers, winning with total slop. SO what will happen next week? Well these posts sadly disappear until next spring. By then a few new Gentleman will want in this. But we will be selective as to whom will get in our midnight club. You think you’re good enough? 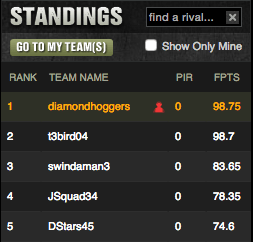 Send an email to diamondhoggers_at_gmail dot com and let us know why you deserve to be in the gentleman’s game. If we get some responses, we’ll post them on the site each week and just possibly invite a new gentleman to the game. Other than that, we’ll miss the fun and exposure we had to eachother from afar in our contests. The memories. C.J. Cron’s backside dump single at one in the morning meaning something to all of us. The little things. Congratulations to our first Gentleman’s Cup Champion, DStars45. His DFS excellence shines through in this contest of warriors.